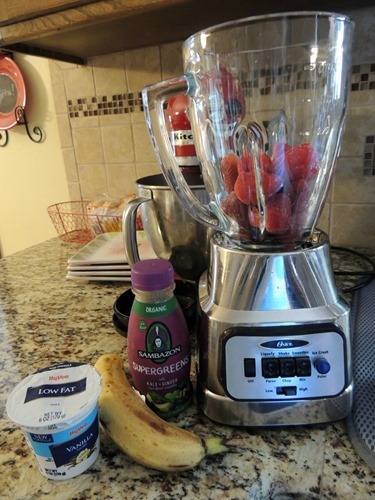 Sambazon Juices and Smoothies–with Giveaway! Since last summer, I’ve been in love with fruit smoothies. I normally make my own, but I was excited to try the ones by Sambazon. 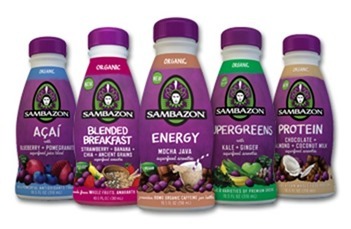 Sambazon juices and smoothies are made with the finest organic Amazon Superfoods on the planet such as Açaí [Ah-sigh-ee], Acerola [Ah-sir-o-la], and Yerba Mate [Yur-ba& Mah-tay]. Their juices and smoothies are available in ten different delicious flavor varieties, and packed with antioxidants and healthy omega 3-6-9s. 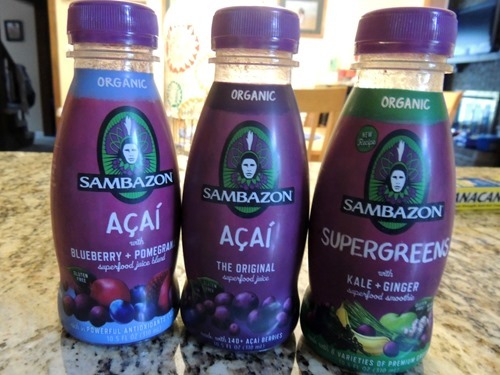 All Sambazon Superfood juices are NON-GMO, USDA organic, vegan, gluten-free, and provide whole food nutrition. 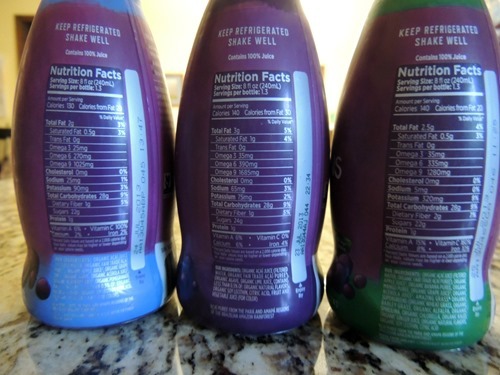 • A bottle of Sambazon Superfood juice (10.5 ounces) retails for $2.99. Açaí /Antioxidant: This Original Amazon superfood juice is bursting with powerful antioxidants and healthy omegas. It’s a delicious way to combat free radicals and comes in two flavors: Original or Açaí+Blueberry+Pomegranate. Energy: This potent blend of Açaí berries, Yerba Mate, and Guarana delivers a whole food experience that boosts the body and mind the way nature intended. Energy is available in two flavors: A rich berry superfood juice blend with 50mg of organic caffeine per bottle, and a new Mocha Java superfood smoothie with 80mg of organic caffeine from fair trade coffee beans, plus a hint of chocolate. Supergreens with Kale + Ginger: This is a potent blend of Açaí berries, a powerful new blend of six varieties, plus a hint of ginger. It delivers around two servings of whole fruits and veggies, without added sugar. First, I used frozen strawberries and used the ice crush mode. I added a banana, the Supergreens juice, and vanilla yogurt. 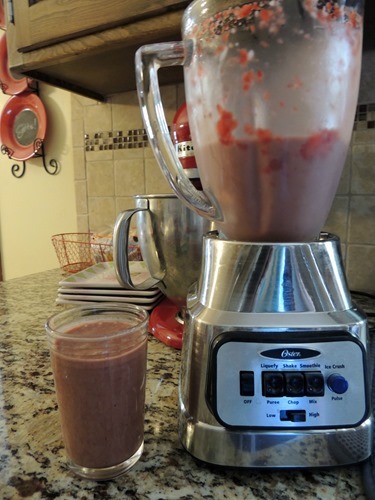 I blended it all up and drank it! Yum! Want to learn more about Sambazon? Visit their facebook page at facebook.com/sambazon. Guess what else? I’m hosting a giveaway right here for three free product vouchers plus a wooden bowl and spoon from Sambazon. The giveaway is open to U.S. residents only. You can enter using the rafflecopter form below!